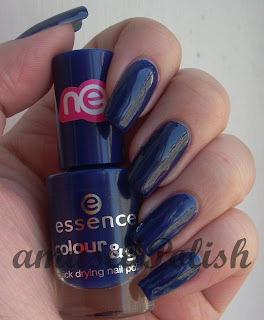 Essence Just Rock It(JRI) is one of the new shades Essence introduced this fall. It's a blurple creme, and looks a bit jelly-ish in the bottle. JRI was opaque in two coats and it was a bit boring for my taste. 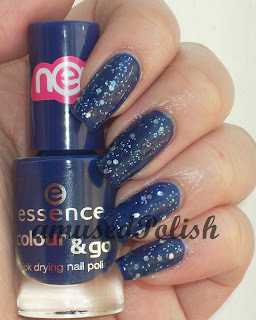 So I added a coat of the blue Etos Effect Nails which I got in a swap from Marte of Girly Addictions. 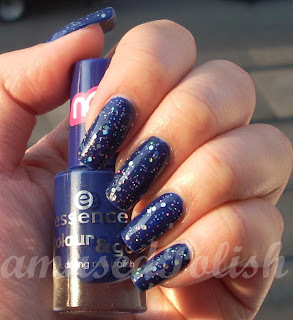 The glitter-topcoat has silver holo hex-glitter in it and some regular sized silver glitter in a colored base. First up, a swatch of Just Rock It on its own.